Government is a system of social control under which the right to make laws, and the right to enforce them, is vested in a particular group in society. Organizationally, governments may be classified into parliamentary or presidential systems, depending on the relationship between executive and legislature. Government may also be classified according to the distribution of power at different levels. It may be unitary—that is, with the central government controlling local affairs—or it may be federated or confederated, according to the degree of autonomy of local government. When this system of social control is being implemented to a large extent on the platform of information and communication technology (ICT), then we have an electronic government (e-government). E-government refers to the provision of online public services to citizens and businesses. Services for citizens include registration to government services, such as health care, education or employment benefits. For businesses, e-government services can take the form of online alerts for public procurements or funding opportunities as well as information and support on applicable legislation in a given sector. E-government is widely viewed as an extraordinary opportunity for administrations to cut down their costs, speed up procedures and, therefore, increase their efficiency and reactivity. No doubt, e-government has grown in the past decade worldwide. Its efforts can vary from Web portals to online license renewals to experimentation with online voting. 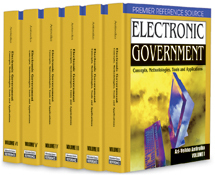 E-government is generally recognized as a means of making government more efficient while allowing it to be more responsive to customer needs (Jeffery, 2005). The growth in e-government has been rapid. For example, in the United States, the percentage of local governments with Web sites increased from 8.7% in 1995 to more than 80.0% in 2000 (Holden, Norris, & Fletcher, 2003). Advances in ICT are helping to make the growth in e-government a global phenomenon. A United Nations report shows that governments around the world are moving towards higher levels of e-government to better serve their citizens (UN-ASPA, 2002). In Africa, e-government is not yet widespread. However, some African countries have embarked on e-government initiatives and have recorded varying degrees of success. This article aims at reviewing some of these initiatives and ultimately recommends the way forward in terms of policy issues and strategies that African governments must put in place for their e-government projects and initiatives to be worthwhile.